Tool that helps Intel Core 2-based (or others) test for system stability in a relatively short time (greatly shorter than Prime95). The program utilizes Intel's very own CPU stress testing binaries for the most stressful, and speedy testing. This software will put even the highest end Intel Core 2 Extreme rigs to their knees, and shows how REALLY stable the system is. It is highly recommended to use a 64-bit Windows operating system (XP x64 preferred) for the most accurate testing and using maximum amount of free system memory. Version 2.54 is a freeware program which does not have restrictions and it's free so it doesn't cost anything. 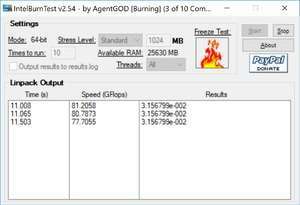 For security reasons, you should also check out the IntelBurnTest download at LO4D.com which includes virus and malware tests. Additional screenshots of this application download may be available, too.